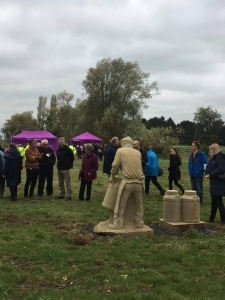 Last week saw the unveiling of a new sculpture for the Nestle site in Hatton in Derbyshire. The sculpture is one of four pieces which form part of the Saltbrook Heritage Trail. 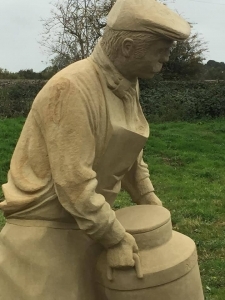 The sculpture trail sits along a new footpath and bridleway that skirts around the outskirts of the Town’s iconic factory and celebrates the industrial heritage of the Town. 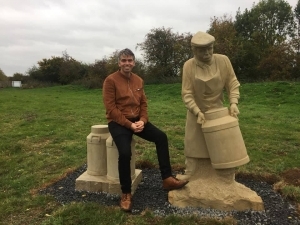 The sculpture that I have carved in Woodkirk sandstone takes the viewer back to the early days of the Nestle story in Hatton, to a time when the local farmers would bring milk in churns that would then be converted into condensed milk. The life sized carving of the figure can be seen moving a churn into an adjacent stack. During his time at the workshop, the figure became known as “Norbert”. “Norbert” weighs just over a tonne and took about 6 weeks to carve.